White House gardener Cassandra "Casey" Calhoun heads out one morning to weed out her nervousness before her first presentation to the First Lady and ends up attacked and left in a flowerbed. After she is found by Secret Service Special Agent Jack Turner, they discover a dead woman nearby with a resemblance to Casey. Was it just a case of mistaken identity? While the police and federal agents are ready to blame the protesters that are picketing against a banking summit the President has arranged, Casey is sure there is more to the story. Knowing that she is the only supposed witness to the crime (because she can't really remember anything), and focused on bringing the murder victim to justice for her own reasons, Casey is determined to dig out the truth before she or anyone else gets hurt. 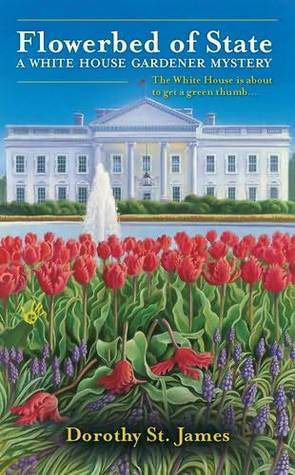 Flowerbed of State is the first of the new White House Gardener Mystery series by Dorothy St. James. The mystery begins just a few pages in and moves at a fast clip. A large amount of story-building is done in this book, but St. James doesn't gloss over the character development. Casey is a sweet Southern woman with her own painful past, and between that and the mystery novels Casey loves there is no doubt that she will be involved in figuring out who attacked her and killed the other woman. I found Casey's back story intriguing and a driving force for her sleuthing without being wedged into the plot. You do have the prerequisite hints at a romance and the topical information about gardening, but it is all woven into the prose instead of listed at the end and enhances the story as a whole. Flowerbed of State was a fun cozy mystery and one that will appeal to many. St. James has seeded a second story thread with Casey's past and I will be waiting for the sequel to see what grows.